UFO hunters claim to have sighted a giant alien UFO spacecraft flying through our inner solar system in an image of the Sun snapped by cameras on board the Solar and Heliospheric Observatory (SOHO) on September 11, 2016. According to UFO researchers, this is not the first time that the UFO has been seen flying near the Sun-Earth L1 gravitational balance point in our solar system. 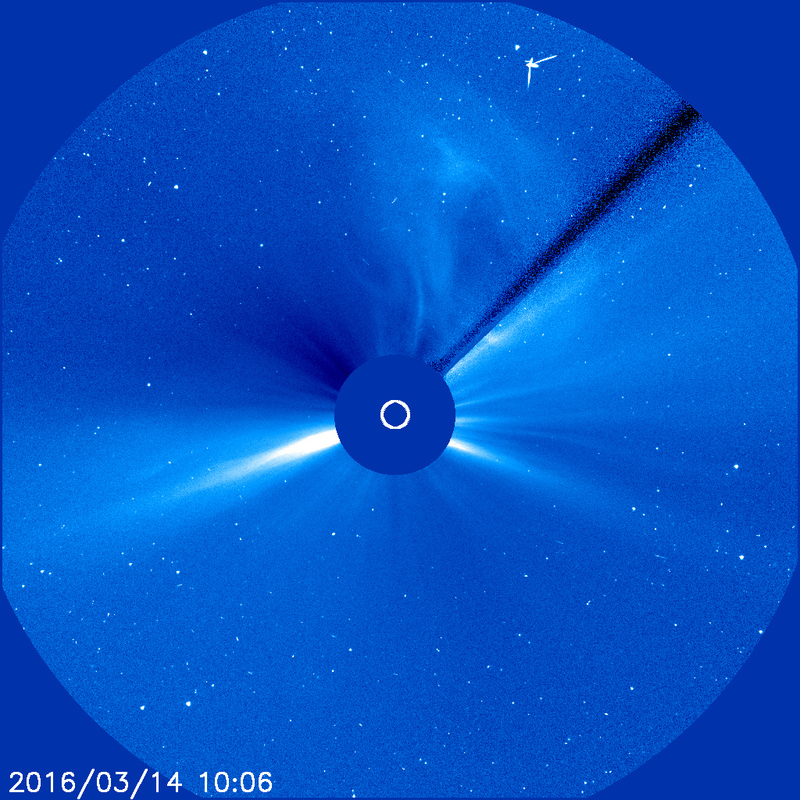 SOHO cameras captured similar flybys in 2011, 2012, and 2016. The SOHO satellite — managed jointly by NASA and the European Space Agency (ESA) — is stationed in halo orbit around point L1 from where it transmits to Earth near-real-time data about solar activity that helps to predict space weather. The UFO sighted in an image captured by NASA’s SOHO LASCO C2 camera has multiple long arms that could be communication antennae, according to UFO hunters. The mysterious space object is eerily similar to the Russian Sputnik 1, the first artificial Earth satellite. The SOHO image showing the alleged mysterious UFO was uploaded to YouTube on September 12, 2016, by UFO hunters Streetcap1 and UFOvni2012 (see below). The YouTube below shows the same UFO, captured by SOHO’s LASCO C2, passing through our inner solar system close to the Sun on November 27, 2011, and April 4, 2012 (see 1:42 mark). UFO blogger Scott C. Waring featured Streetcap1’s YouTube on his UFO Sightings Daily blog. Waring was able to identify only four long arms projecting from the body of the spacecraft. But UFOvni2012 claimed to be able to identify 5-7 arms. The alien hunter insisted that the arms were not vapor or smoke trails from the engine exhaust but real solid appendages much like antennae. 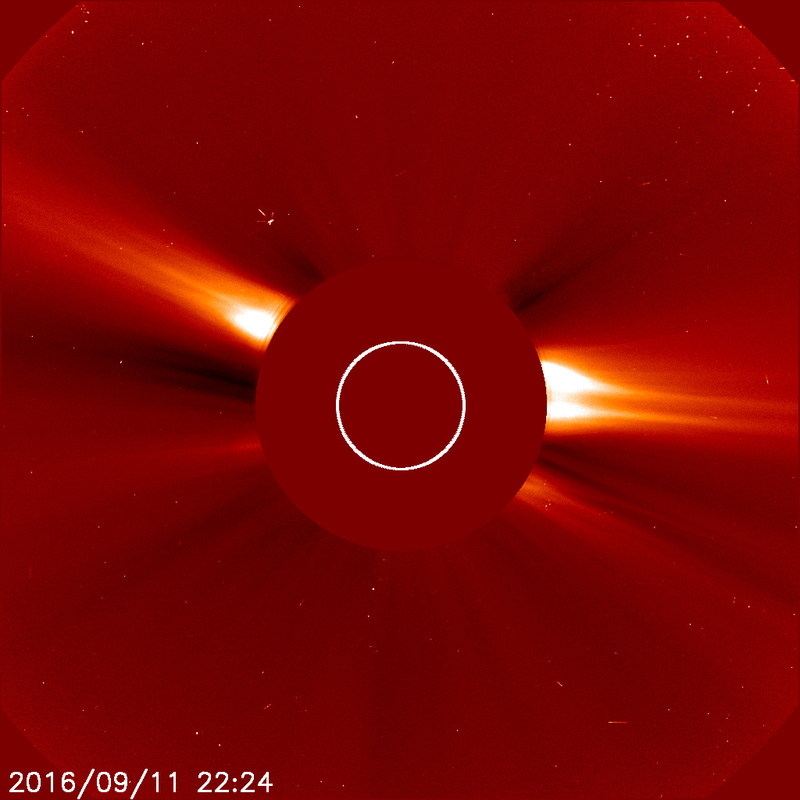 Alien and UFO hunters have debated why the UFO has repeatedly been seen near the Sun in SOHO images. Some enthusiasts suggest that the alien craft follows a fixed interstellar route that takes it past our Sun regularly. According to UFO hunters who keep a constant watch on SOHO images uploaded regularly to NASA’s Helioviewer website, there is evidence that a major and busy interstellar highway passes through our inner solar system. Our Sun appears to be a popular stopover for interstellar crafts, including cruiseships, battleships, and expeditionary fleets, passing through our solar neighborhood. UFO hunters claim that alien crafts are regularly spotted entering the Sun’s orbit to refuel by “sucking” energy from the star’s fiery atmosphere, just like automobiles traveling on a highway pull into a gas station to refuel. The Inquisitr reported earlier in March that Streetcap1 claimed to have spotted the same massive UFO — “a craft with long arms” — in two SOHO images of the Sun snapped on March 14, 2016. 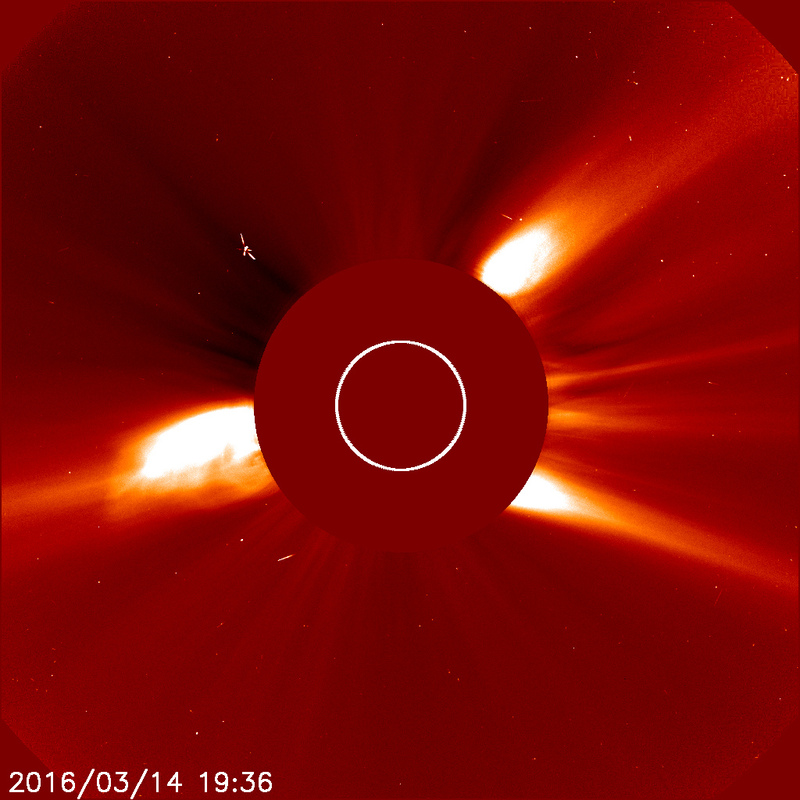 The first image was captured by SOHO’s LASCO C2 camera and the second image a few hours later by SOHO’s LASCO C3. Streetcap1 and fellow alien hunters challenged NASA to give an explanation of the mysterious object, arguing that recurrence of the same structure in two images snapped on the same day by different SOHO cameras proved that the object was not due to an accidental flaw in the digital image. The Inquisitr reported at the time that UFO hunters accused NASA of silence in the face of glaring evidence of a constant stream of interstellar spacecraft through our inner solar system. According to UFO hunters, NASA has studiously refused to comment on the repeated appearance in SOHO satellite images of massive, often planet-sized objects of obvious artificial design, many with symmetric structures and unmistakable aerodynamic features. Alien hunters often point to a remarkable sighting reported by Streetcap1 in July 2015 as proof that alien UFOs fly past the point L1 in our inner solar system regularly. The SOHO image appeared to show a fleet of three identical and symmetrically structured UFOs flying in a neat line formation (see video below). The sighting caused considerable excitement among members of the UFO community who challenged skeptics to provide an alternative logically consistent explanation. “These objects have structure and for NASA to dismiss them as nothing is an insult to people’s intelligence. If they post data then they must expect UFO hunters to find anomalies and share them,” Streetcap1 said.